K+ is a hugely important electrolyte within the body and plays a vital role in maintaining the resting membrane potential of cells. Even a small change in the extracellular concentration of K+ could depolarize or hyperpolarize cells quite significantly, which has big implications for cardiac function amongst other things. 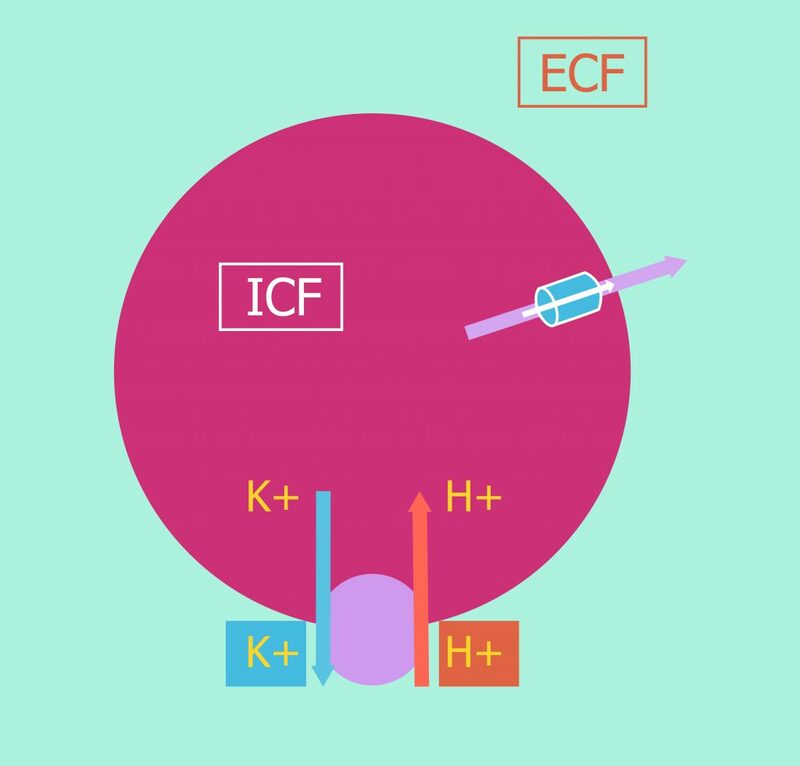 The concept of maintaining an internal balance of K+ refers to its movement between the extracellular fluid (ECF) and intracellular fluid (ICF). The normal concentrations of K+ in each vary somewhat but are said to be between 3.5-5.0 mmol/L in the ECF and between 120-150 mmol/L in the ICF. 98% of the body’s K+ is stored intracellularly. An increase in K+ concentration in the ECF will in itself promote the movement of K+ into cells down its concentration gradient. However, the internal balance of K+ is not this simple and there are other factors to consider. When we eat a meal, insulin is secreted by the pancreas in response to increased K+ concentrations in the splanchnic blood. This acts to increase the activity of Na+/K+-ATPase channels, therefore moving the excess K+ into cells. This homeostatic mechanism helps to prevent dangerous rises in serum K+ after eating. Other hormones which act on Na+/K+-ATPase channels include aldosterone and catecholamines. Alkalosis will also cause a decrease in ECF K+ concentration. This is due to the close relationship of the concentration of K+ with the pH of ECF. A decrease in the concentration of H+ ions (i.e. an increase in pH) will lead to H+ ions being transported out of cells. This causes a reciprocal shift of K+ into cells, thereby lowering the concentration of K+ in the ECF. Conversely, an increase in H+ ion concentration (acidosis) causes H+ to move into cells, drawing K+ out. Fig 1 – Diagram showing the movement of potassium into cells. A low concentration of ECF K+ promotes the movement of K+ out of cells down its concentration gradient. During exercise, skeletal muscle contracts, causing the net release of K+ from these cells. This will lead to an increase in ECF K+ concentration, proportional to the intensity of the exercise. Hyperkalaemia is prevented due to the uptake of K+ by other non-contracting cells. Furthermore, exercise causes the release of catecholamines such as adrenaline which increases K+ uptake by other cells via Na+/K+-ATPase channels as mentioned earlier. This can lead to short-term hypokalaemia when exercise is stopped. Acidosis has been described earlier and will also cause an increase in the concentration of ECF K+. Cell lysis will also cause the release of intracellular K+ into the ECF. This is clinically relevant in the condition rhabdomyolysis where significant trauma to skeletal muscle, such as in crush injuries, causes cell lysis and resultant hyperkalaemia. If plasma tonicity becomes increased, water will leave cells to compensate. 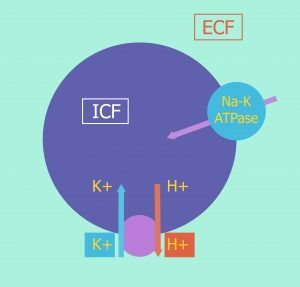 This will increase the intracellular concentration of K+, causing it to leave the cell and enter the ECF down its concentration gradient. Fig 2 – Diagram showing the movement of potassium out of cells. A serum K+ level of below 3.5mmol/l is diagnostic of hypokalaemia. Cardiac function is one of the main things to be affected due to the chemical gradient of K+ being increased, causing cell hyperpolarisation. ECG changes associated with this include a low T wave, high U wave, and in severe hypokalaemia, ST depression. The changes in resting membrane potential also alter the excitability of smooth muscle in the gut, which can potentially lead to a condition called paralytic ileus, where peristalsis of the gut is slowed or stopped completely such that bowel obstruction can occur. The excitability of skeletal muscle can also be affected, leading to muscle weakness. Hypokalaemia may also cause the kidneys to become unresponsive to antidiuretic hormone (ADH). As a result of this, nephrons have a reduced ability to reabsorb water, causing the condition of nephrogenic diabetes insipidus. As with hyperkalaemia, hypokalaemia can be caused by either problems to do with the external or internal balance of K+. Problems of external balance are usually to do with excessive loss such as in diarrhoea and vomiting. Loss of K+ could also be via the kidneys if certain types of diuretic drugs are used or if there is osmotic diuresis as a result of diabetes mellitus. Hypokalaemia can be treated through IV or oral K+ replacement therapy. However, more specific treatments can vary depending on the cause of the hypokalaemia, so it is important that this is established. For example, if the cause is due to increased mineralocorticoid activity, K+ sparing diuretics such as spironolactone can be used, which block the action of aldosterone on principal cells in the nephron. 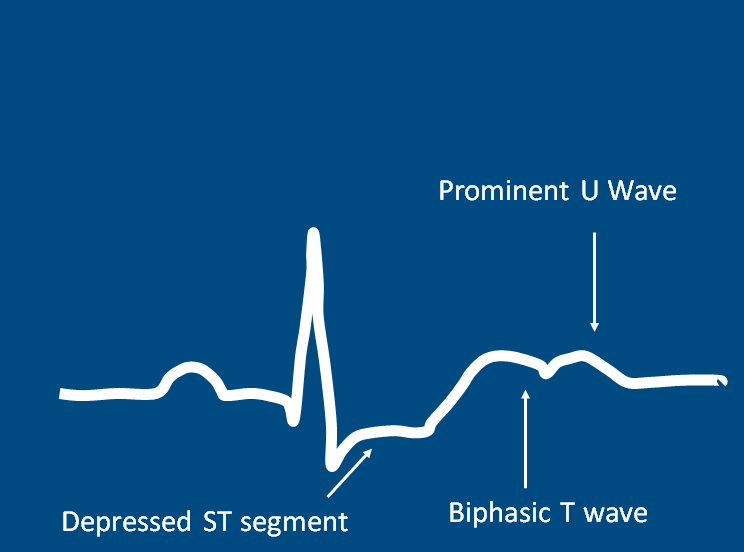 Fig 3 – ECG changes seen in hypokalaemia. Which of these is not a treatment for hyperkalaemia? Which of these can not cause hypokalaemia? Which of these is not a symptom of Hypokalaemia?